Garin Pirnia was raised on a healthy diet of MTV and Top 40 radio in the suburbs of Dayton, Ohio, but one day she realized she wanted to make movies, so she moved to Hollywood. After realizing they just didn’t give out three picture deals on Sunset Blvd., she decided to move back to the Midwest. Formerly based in Chicago for 7 years and now based in Cincinnati/Northern Ky., she’s written about arts and culture–with an emphasis on music, film, food, and travel–for more than 40 local and national publications, including Rolling Stone, The Wall Street Journal’s Speakeasy blog, Esquire, Vanity Fair, Complex, AirTran’s in-flight magazine Go, TimeOut Chicago, The Onion AV Club, NewCity Chicago, AOL/Spinner.com, Chicago Innerview, WonkaVision, MyOpenBar.com, Mental Floss, The Atlantic, Paste, Eater, Huffington Post, Vice/Noisey.com, CityBeat, Cincinnati Enquirer, WCPO.com, and Cincinnati Magazine. She’s also a screenwriter/filmmaker who loves cats, as seen in her award-winning short horror script, The Finicky Cat, which is about a cat who has a hankering for human brains. It’s loosely based on a true story. 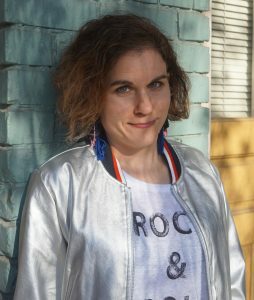 She’s also an author: the University Press of Kentucky published the culinary travelogue The Beer Cheese Book in 2017; in 2018 the Indiana University Press/Red Lightning Books published her book on the Ohio rock music scene, Rebels and Underdogs: The Story of Ohio Rock and Roll. I've covered it all, from Arcade Fire to Yeasayer. © 2006–2019 Garin Pirnia — Sitemap — Cutline by Chris Pearson.